In the weeks of the Indian general election, more than 431 million women will be called to the polls—and a higher percentage than ever before is expected to answer the call. 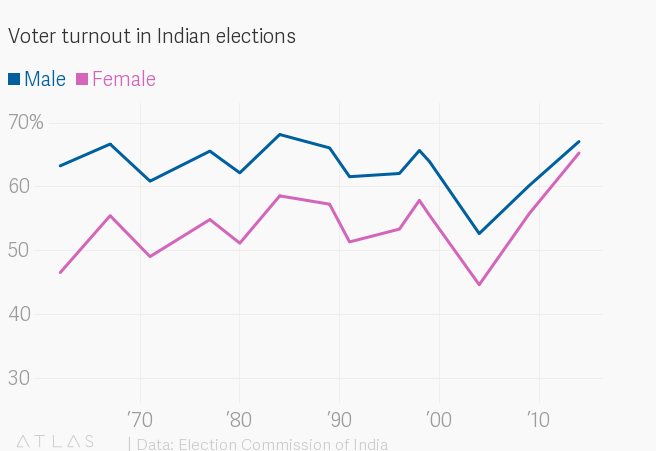 Women’s turnout at the polls has increased dramatically through the many Indian elections. In 1962, the first year data on turnout by gender was collected, only about 47% of female voters showed up; in 2014, some 66% of them did. In the same time, male turnout only went up about five percentage points. Some analysts even predict women may make up over 50% of the voters this time around. That is if the voter rolls let them. This general election, cries of irregularities at the polls and voter suppression have been louder than in previous instances. There have been allegations of tampering with electronic voting machines (EVMs), besides editing millions of Muslims and Dalits (those formerly deemed untouchable) out of the voter rolls. Khalid Saifullah, a computer engineer by day and psephologist by night, made an app to check voter suppression: Called Missing Voters, the app, downloaded by 50,000 people according to Saifullah, allows people to verify if they are on the rolls. It also provides support to amend the list should the person be missing. Saifullah began working on the app in 2014, with a different goal: he wanted to help widows and senior citizens to register for their pensions. To identify them, he downloaded electoral rolls from the election commission of India’s site, mining data for 800 state assembly constituencies, about a fifth of the total 4,210. When he looked for data to identify widows, something jumped out to him: In a country where large, joint families are the norm, the electoral rolls seemed to have many single-adult households. “I found that the census had 4% single-person households,” says Saifullah, “I had more than 10%.” That is when he created Missing Voters, and invited volunteers to download it and help people enrol if they were missing from the electoral rolls. So far, Saifullah says at least 160,000 voters were able to enrol through the app, with the help of 60,000 volunteers who went door to door to check on whether all the adults of the household had effectively been represented in the poll. The data collected from the app also allowed Saifullah to estimate the number of people missing from the voter rolls, by calculating the difference between the number of single-person households in the census and those in the electoral rolls, then calculating how many more people should be in the rolls if there was at least one more voter in the household (the average household size in India is 2.9 people). Saifullah also found that in households where one voter was registered, it was more often a man, and came to the alarming conclusion that “65 million women” may be missing from the rolls. This number is much higher than the conservative estimates based just on discrepancies between women in the census and number of female voters. Those calculations found that the missing women would be somewhere in the order of 21 million—still, a significant percentage of the overall voter roll; enough to move the needle on the election and to raise doubts on the democratic legitimacy of the exercise. The issue of female voter suppression in India is complex, and not necessarily new, explains Milan Vaishnav, researcher on Indian democracy and the director of the Canergie Endowment for International Peace in South Asia. “There is a gender gap when it comes to voter registration,” says Vaishnav, advancing several hypotheses as to why that is. Disenfranchisement and suppression both play a role, he explains, in the lack of women voters, as do traditional practices. “In many parts of India women shrink from interacting with the [election commission] agent,” Vaishnav explains, especially if he’s a man, so they may skip the opportunities of registration; in other cases, they may be actively discouraged from registering by their husbands or families. In that sense, women never fully benefited from constitutional enfranchisement. Further, keeping voter rolls up to date can be an issue, especially in urban areas where migration, overpopulation, and lack of permanent addresses can make voters hard to locate. Then there is the issue of deliberate removal from the lists: This is likely more recent, and linked with a higher degree of female involvement in democracy. The more women vote, the more they need to be taken into account by politicians, but since they have for a long time been “silent voters,” Vaishnav says, it’s hard to predict how they will vote. “Political parties consider them to be swing voters,” he explains, because they don’t have any long-time, deep allegiance to a party, so they may be a target to suppression to avoid surprises. Although deliberate voter suppression is concerning, says Vaishnav, there is also something positive hiding underneath it: It signals that women are now recognised as a voting force to reckon with. As female turnout converges with the male turnout, he says, parties are recognising that women will make choice independently from the male head of their household. The editing of rolls is also linked to another encouraging change: With the introduction of the electronic voting machines (EVMs), and the higher level of security adopted at the polls in recent years, it is harder to rig the election by so-called “booth capturing,” a practice where a group of armed party supporters would take over a polling booth and stuff paper ballots filled to support their candidates in the voting boxes. So, Vaishnav explains, “suppression gets pushed from the polls to the villages,” and the voter rolls, where it is harder to track.